It’s time to get your tickets for Chai in the Hub! Come celebrate our 10 amazing Chai in the Hub honorees on Saturday, February 3. You'll also hear from actress and comedian Susie Essman, our guest speaker of Broad City and Curb Your Enthusiasm fame. Then, you can dance the night away at the party of the year. Get your tickets today! As Barry Shrage, our beloved current President, prepares for his next chapter, CJP is unveiling Bridge to the Future, our expanded initiative for engaging young adults more deeply in Jewish life and redefining how we build and sustain Jewish community. We’re hosting a celebration of learning on Sunday, April 29 at The Westin Copley Place as a tribute to Barry and the new initiative, and we hope you’ll join us! More details are coming soon. CJP is currently searching for our next President and CEO, and we’re excited to report that we’re well into the interview phase. We regularly update the President Search page on CJP.org to keep you up to date with the hard work of our President Search Committee. If you have any questions or insight about the search, please send them to CJPpresidentsearch@cjp.org. The Rabbi Samuel Chiel (zt”l) Genesis Forum is coming back to CJP in downtown Boston! Bring your lunch and get ready to discuss what Jewish tradition has to teach us about negotiating the ethical challenges we all face. The first session of 2018 meets on Wednesday, January 10 at noon, and it will focus on Procreation and Parenthood. Check out the dates and topics, and be sure to register in advance – you can even join the group lunch order from the Milk Street Cafe! Want to put some of your passion for doing good into action? Come to Hands-On Philanthropy! Women’s Philanthropy is holding a sorting and donation party to benefit the Clothing Closet of Jewish Family Service of Metrowest on Thursday, January 18 – sign up today! You can also make a donation when you register to support the cost of purchasing additional clothing before the event. If you’re in the legal or accounting fields, the Lawyers & Accountants Annual Reception is the can’t-miss networking event of the year (and yes, we know it’s only the first month of 2018!). Join us on January 25 at the Fairmont Copley Plaza to connect with others, enjoy hors d’oeuvres and dessert, and hear Maura Healey, Massachusetts Attorney General, discuss her office’s role in protecting our civil rights and promoting the interests of all within the Commonwealth. And join the Young Lawyers & Accountants after the program at the hotel’s Oak Long Bar to chat some more and learn about the new Young Lawyers Network. The first Jewgooders of 2018 is coming up, so save Thursday, February 22 for a night of friends and giving back. We’re still planning the best midwinter evening possible, so we'll let you know as soon as you can reserve your spot! Now that 2018 is here, we hope you’ll Read On with CJP! This winter, the whole Greater Boston Jewish community is reading The Cooking Gene, a compelling memoir by Michael W. Twitty, an African American gay man with southern roots who chose Judaism. He’s coming to Boston to discuss his book with us on Monday, April 9, but there are book clubs and online discussions about it until then! Join the conversation on JewishBoston.com/ReadOn. Join Yachad New England for a weekly movie club that’s also a relationship-building course for 22-to-30-year olds with disabilities who love movies and want to improve their social skills. The next one is on January 22 at Temple Reyim in Newton — get your tickets today! Want to know more about the Jewish holidays throughout the spring? Join our Cambridge Eser discussion group about holidays and lifecycle events. Connect with other young professionals in their 20s and 30s and learn about the whats, the whys, and the hows of the holidays. The group starts Monday, January 22, but registration closes on January 15, so don’t wait to reserve your spot. Looking for a Shabbat experience in Cambridge? The Riverway Project is hosting the next Shabbat in the ‘Bridge on Friday, January 26. There’ll be a musical Qabbalat Shabbat service and a shared dinner, so get more details and sign up today. Know any highly-qualified Israelis and Palestinians who are ready to change the world? Applications are now open for the 2018 class of Our Generation Speaks, a fully-funded fellowship program and incubator in cooperation with MassChallenge. These emerging leaders create high-impact ventures and study at Brandeis or MIT during 3 months in Boston this summer. Have what it takes or know someone who does? Apply now! Thank you to everyone (almost 3,000 of you!) who came out to the MFA’s Festival of Lights Hanukkah celebration. 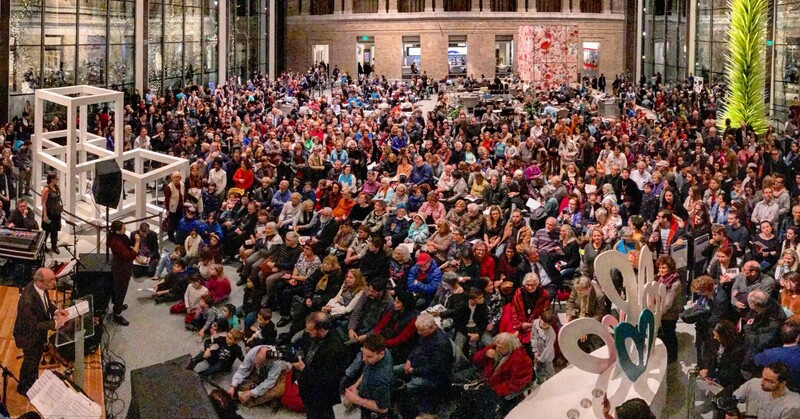 We love this photo taken by Jennifer LeClerc of the MFA — it’s like an I Spy of all our favorite people! We hope you had a wonderful holiday season and that your 2018 is off to an amazing start. We almost had a month without a holiday, but Tu B’Shevat, the new year of trees, is January 31! It’s a great reminder that spring will come someday, and the days are getting longer, too! January 5 | 4:08 p.m.
January 12 | 4:16 p.m.
January 19 | 4:24 p.m.
January 26 | 4:33 p.m.